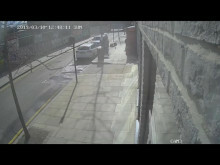 Police have today, Monday, 18 March, released CCTV footage of an incident in Hackney which has left a cyclist hospitalised in a critical condition. At around 1245hrs on Sunday, 10 March, the 30-year-old male victim was riding his bike on Wallis Road, E9 when another cyclist caught him up and began to cycle alongside him. The male attacker than kicked the victim off his bike, resulting in him falling off and colliding with a parked car. The victim was taken by ambulance to an east London hospital, where he remains in a condition is critical.